The Davenport Diamond Grade Separation project would remove the ground-level rail crossing where CP freight trains cross GO passenger tracks. Removing this crossing is part of the plan to increase GO train service for residents of the Greater Toronto and Hamilton Area as it will increase the reliability, efficiency and safety of the crossing as trains will no longer need to stop to let an oncoming freight train cross. The process to remove a crossing and build new rail infrastructure starts with a feasibility study, or a study that looks at what would be involved with moving forward with either an overpass or an underpass. A number of factors influence the decision of how to move forward with a project and the feasibility report provides details that informs decision making. There are two basic options when eliminating crossings, tracks can either go over or under each other. In this case, the CP tracks cannot be raised or lowered easily as due to their weight and length freight trains are only able to climb limited grades. This means for the CP corridor to be buried CP tracks would have to start sloping (either up or down) at Runnymede Road in the west and Christie Street in the east to pass over or under the GO tracks. This is not a feasible approach due to length, impact on communities, and utilities. In the case of the Davenport Diamond, the initial review also looked at the ways the GO corridor could go over or under the CP tracks which included overpass options (open column or “guideway” structure and closed solid structure), and a trench (open underpass) option. 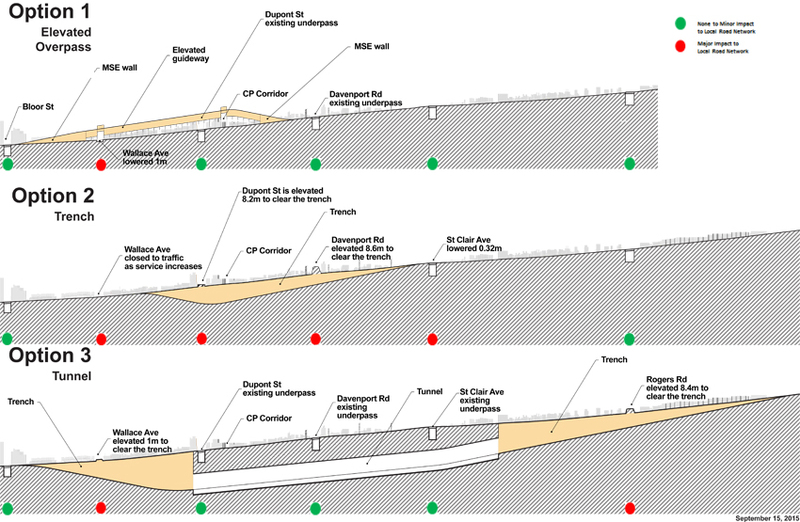 Similar to the assessment of raising or lowering the CP corridor, the larger footprint of a tunnel would mean greater community impact and complexity and therefore it was not initially moved forward in the process for further analysis. 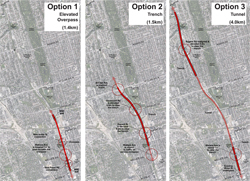 Early pre-engagement feedback from residents and the City of Toronto asked for more information about a tunnel option as it was seen to minimize impacts to the residents of the Davenport community. This work was completed in late September, 2015 and is therefore included in the Executive Summary and Appendix portions of the document. The feasibility analysis includes initial engineering and design work on the various options and includes an analysis of a number of criteria including the short and long-term impacts of construction on roads, utilities, and road traffic, public health and environmental impacts, how difficult it is to build and overall affordability of the option. This work was completed for the Davenport Diamond project and the feasibility report shows that while there is no solution without impacts and the overpass has a visual impact on the community, when considered in the context of the benefits provided by the overpass and some of the significant negative impacts of the trench and tunnel, the overpass is the preferred choice for both better rail service and the community. The overpass can be built within the existing GO corridor and has the smallest footprint of impact to the community. The 1.4 km overpass would start north of Bloor Street West and end just south of Davenport Road. It allows for the reconnection of Paton Avenue for pedestrians and cyclists, removes the existing crossing at Wallace Avenue and replaces it with a rail over road grade separation, allows for the connection of Antler Street and Lappin Avenue and the removal of the existing road under rail grade separation at Dupont Street. It is also expected to cause limited disruption to the existing road network, transit and emergency services during construction and take 18 to 24 months to complete. While the trench option was designed to minimize the footprint of impact by having trains fully underground only in areas directly under the CP corridor, the analysis shows it would cause significant disruption to the community during construction. 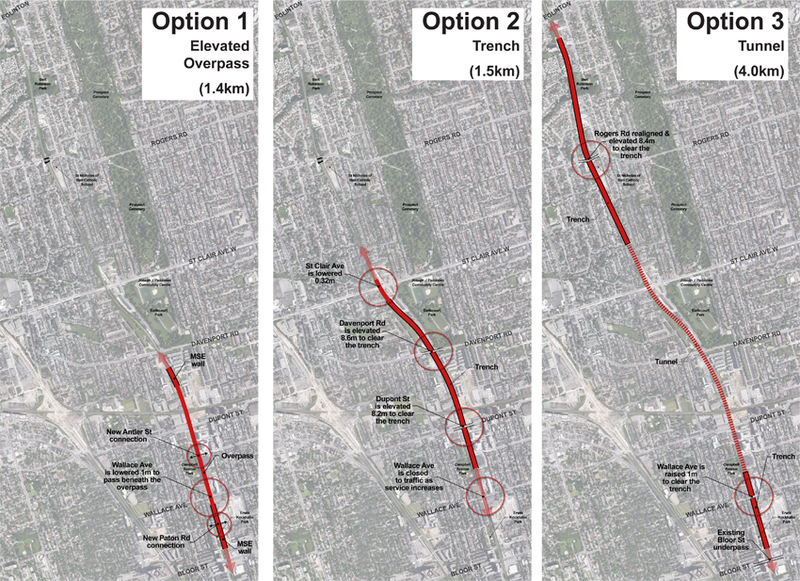 The proposed 1.5 km trench would start to drop down south of Dupont Street, pass under the CP tracks and then climb back up emerging just north of St. Clair Avenue. Key impacts include major disruption to roadways and surface transit. This would include long term closures of Davenport Road and Dupont Street that would need to be reconstructed to pass over the rail corridor instead of passing under the corridor as they currently do. The existing road under rail grade separation at St. Clair Avenue West would need to be lowered and utilities on Lappin Avenue, Dupont Street, Davenport Road, and St. Clair Avenue West that pass under the existing tracks would need to be diverted around or under the trench. This construction work would require long, simultaneous road closures on Dupont Street and Davenport Road, reconstruction of the St. Clair streetcar tracks in the area of the existing grade separation, severe disruption to traffic in the neighbourhood, and, potentially, to rail traffic as well. This option is more complex from a construction and operational engineering perspective, more costly taking 6 to 7 years to complete. The trench would act as a barrier to roads and connectivity across the corridor or provide any space for use by the community. 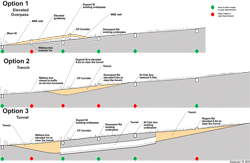 The tunnel would avoid the visual impact of the overpass as well as reduce noise and vibration however it pushes many of the disruptions and challenges of the trench option out to surrounding communities. The 4 km structure with approximately a 2 km tunnel flanked by 1 km open trenches on either side would start at Bloor Street West and come up at Eglinton Avenue West. Since the tunnel would need to be much deeper than the trench option, the trenches on each side of the tunnel would be longer and deeper than the trench option. The Roger’s Road community would be impacted with significant changes to the existing grade separation resulting in a large overpass structure for Rogers Road to cross the corridor. Raising Rogers Road by approximately 8 meters would have a significant impact on local roads and properties. A number of residential properties would require acquisitions and trench and new overpass would mean access and construction disruption to an area school. A long temporary closure of Wallace Road may also be required to construct a bridge over the south tunnel approach or trench. Finally, a station at Bloor Street is being considered as part of a larger review of new stations across the system, and none of the above options (overpass, trench or tunnel) affect the ability to develop a future station. With feasibility work completed, we will be responding to community comments or points of clarification to ensure that questions about the technical review are addressed. If you have any questions, you can contact us at RERDavenport@metrolinx.com or 647-260-6719 and a member of the team will get back to you. As a project that falls under the provincial Transit Project Assessment Process we must identify and move forward with a preferred option, or the way we propose to build this project, as outlined in the regulation. We are working towards beginning the formal consultation period in January 2016. During this 120 day process, we will be providing details about the environmental studies that have been completed on the preferred overpass option and consulting with the community so that resident feedback is included as part of the final report that goes to the Ministry of Environment and Climate Change for decision. All public comments and submissions will be logged and form a public record file that will be submitted as part of the Environmental Project Report to the Minister of Environment and Climate Change. The Davenport Diamond project is part of The Big Move, the provincial transportation plan for the region developed by Metrolinx.